Methods We performed an electronic search of outpatient letters, created or altered between 01/01/2011 – 31/12/2011, that included the terms: chronic abdominal pain, recurrent abdominal pain, functional abdominal pain, functional dyspepsia, irritable bowel syndrome, abdominal migraine, and functional abdominal pain syndrome. We reviewed the letters, investigations and results, management options and outcome of the patients with a new diagnosis of a functional abdominal pain, until June 2012. The following diagnostic criteria were used: age: 4–18yrs, at least 3 episodes of pain over 3 months, no “alarm symptoms”, and normal examination. The use of faecal occult blood test as a screening tool was noted in the investigations section. Results We identified 25 newly diagnosed patients; 10 females, mean age 9.68yrs. Four patients did not fulfil the clinical criteria for diagnosis. A total of 131 investigations were carried out for 21 patients; 4 patients had no investigations done. No patient had a faecal occult blood test. 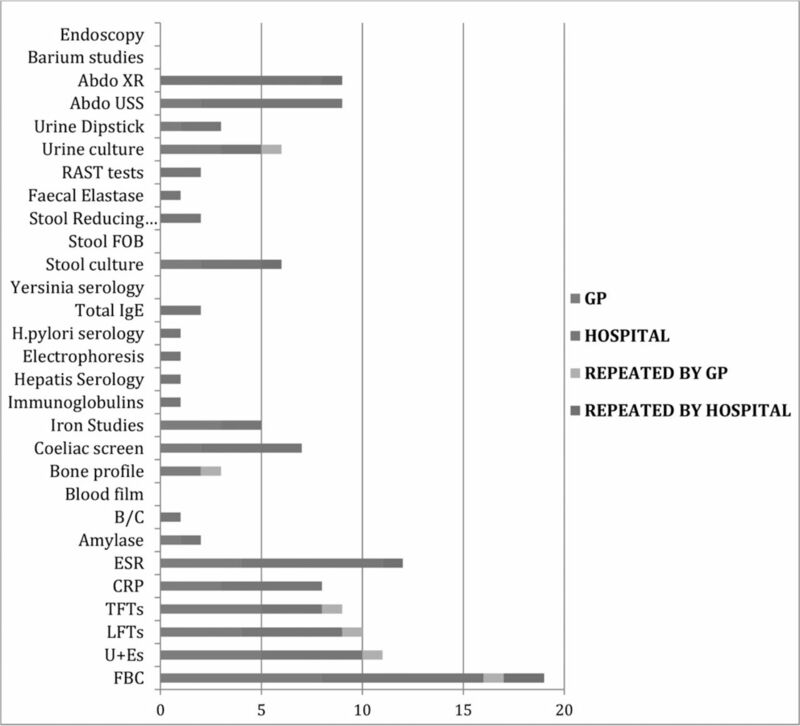 There were 12 abnormal results; only 2 had a clinical significance (one patient diagnosed with constipation following an abdominal X-ray, one patient was referred to surgeons with an incidental finding of a pelvic dermoid cyst on abdominal X-ray). A wide range of pharmacological interventions were recommended with unknown value. No patients were offered cognitive behavioural therapy or referred to CAMHS. Eight patients monitored or altered their diet but only 2 were referred to a dietician. In total, 53 appointments were offered and 39 attended. Fourteen patients cancelled or did not attend their follow up appointments, 5 patients had resolution of their symptoms and 6 were discharged back to their GP. Clinical investigations are unlikely to inform the management and outcome of children with chronic abdominal pain, no “alarm symptoms” or relevant family history, and normal examination. Reassurance and education should be the primary therapy in children. “Open access” clinic appointments, following the initial consultation, could reduce the number of cancellations and DNAs in Outpatient Clinics.